Here are a few of the countless pictures I have taken while on this trip. Here are 3 of our 6 total group members that I had the privilege of traveling with during the last week of free time while on the trip. This picture was taken in Munich at the BMW Museum. We had the ability to step foot in the luxury cars, and here are some of my friends doing just that. 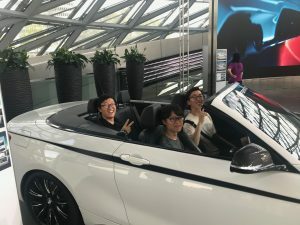 We saw the history of BMW as a whole in the museum, and as well as went on a tour of the plant to see exactly how a BMW is made, and the differences between each model. Here is the first Porsche sportscar that was modeled to kick off our tour of the Porsche Museum in Stuttgart. This was during our last week of Free time, and while in Stuttgart we as well saw the Mercedes Museum. 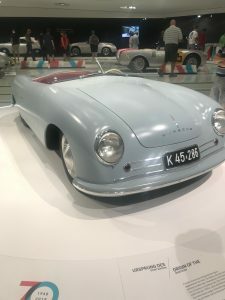 The Porsche museum was laid out perfectly, as we could see each model progressing through the year as technology advanced. The Porsche Museum seemed to be focused mostly around racing, being a powerhouse in the early 1900’s races. There was even a racing simulator in the museum for guests to test their skills at driving an incredibly fast car. Here is another picture taken during my last week of free time during the trip. 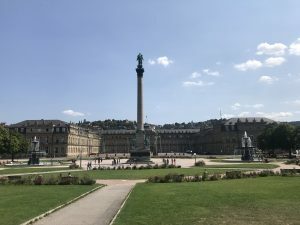 This is the Schloßplatz in Stuttgart, which is located right next to the main shopping center and downtown area of the city. While this picture looks calm and quiet, at night time the square would be littered with people having a good time around the beautifully architectural buildings that creates the square like appearance. There was restaurants that surrounded the area, with live music playing on occasion, which created a lovely vibe at night to sit in the grass and hang out with friends.